Mumbai, Jan 7 (IANS) Salman Khan not only rocked the box office with his blockbuster "Dabangg" but also triumphed at the 17th Annual Star Screen Awards by bagging the best actor trophy for the action-comedy. Vidya Balan walked away with best actress award for her bold and critically appreciated performance in Vishal Bhardwaj's "Ishqiya". 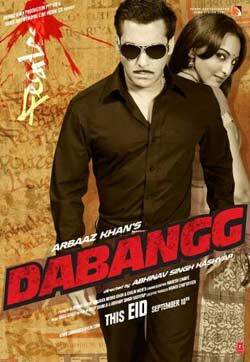 Overall, "Dabangg" bagged six awards, including best music (Sajid-Wajid), best new talent in music (Mamta Sharma), most promising newcomer (Sonakshi Sinha), best choreography (Farah Khan), and best action (Master Vijayan) and emerged as the most awarded film of the evening. However, the surprise element was the tie between "Ishqiya", "Band Baaja Baraat" and small budget film "Udaan" - all three received four awards each. "Ishqiya" also won best supporting actor for Arshad Warsi, best male playback singer for Rahat Fateh Ali Khan and best lyricist for Gulzar. "Udaan" was the winner in categories like best film, best director for Vikramaditya Motwane and best actor in negative role for Ronit Roy and best child artiste for Ayaan Barodia. "Band Baaja Baraat" grabbed most promising male newcomer for Ranveer Singh, most promising debut director for Maneesh Sharma, best dialogue for Habib Faisal and best editing for Namrata Rao. Apart from this, the popular choices awards were bagged by Shah Rukh Khan and Katrina Kaif for best actor and best actress respectively. Ramnath Goenka Memorial Award was bestowed upon "My Name Is Khan" and a special jury award for spectacular cutting-edge technology was given to "Robot" at the gala event Friday evening.